Nintendo Labo has been a hit-or-miss series of cardboard-based games. They have received critical praise but sales have been sub-par based on the initial potential Labo showed when it was initially revealed. That all changed once Labo VR was shown for the first time, and even more so when Nintendo confirmed there will be modes playable in VR for Super Mario Odyssey, or the entire journey for The Legend of Zelda: Breath of the Wild. 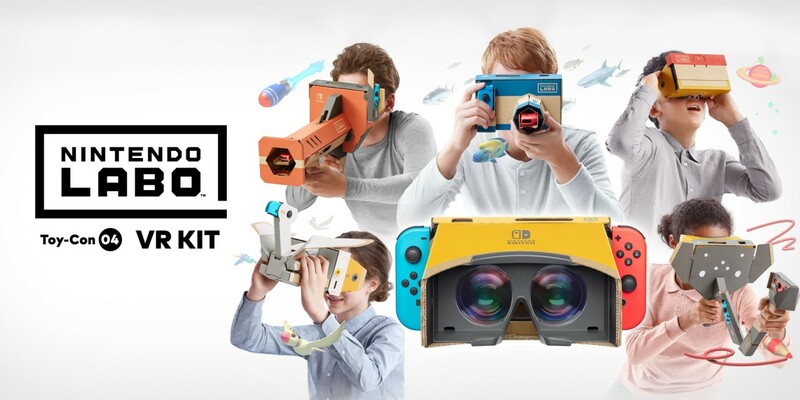 The problem is that April 12th came, but the Nintendo Labo VR kit was missing. Unless you pre-ordered the Labo Toy-Con 04: VR Kit, in all likelihood you will have to wait until sometime next week to get your hands on all of the goodies. Yes, the stores are littered with the starter set + Blaster, but with the potential to get all Toy-Cons at once (and the lack of information of when the other Toy-Con are coming if you get the starter kit) has a lot of people reluctant to invest on it. At this moment, Best Buy stores are unable to place orders in-store for the $79.99 kit but have plenty of VR starters. Online it does allow you go place an order, but the soonest that you can expect to receive one is on April 17th. Gamestop, Target, and Walmart are carrying the starter kit as well, but not the entire set. Both Target and Walmart are showing April 17th as well, with Gamestop displaying a “usually ships in 24 hours message” on their website. Jonathan Ober from Miketendo64 was able to get one of the VR Kits, but it was from Press Play, a local mom-and-pop video game store nearby. If you have those around your area and the big chains are not carrying it (or you didn’t pre-order it), then we would suggest to give them a call. If you were like me, planning on going to the store and picking it up so that you could spend the entire weekend putting the Toy-Con together and playing with your family, then you might need to change your plans or settle for just the Blaster. At the end, I decided to get the VR starter set, just because I will need two VR headsets at some point, and if we can’t enjoy the full set until next week, at least we can begin to have some impressions of what Nintendo has to offer when it comes to VR.